About the secrets of pyramids of Egypt is written much and they gradually clear up. I want to tell about a secret, which did not attract the attention. Look at three small pyramids located near the pyramid Menkaure [Mycerinus]. In the book “The Orion Mystery”, R.Bauval and A.Gilbert try to prove, that the pyramids on the Giza plateau were constructed by the unified plan reflecting the disposition of stars. The disposition and even the size of three main pyramids - Cheops, Chefren and Mycerinus correspond to the disposition and the size of the three stars of Orion's Belt (the Orion constellation). I think, that it is necessary to understand the size of pyramids here is their relative altitude, instead of volume or something still. This conformity is confirmed also by the ancient recordings, mysteriously informing that Egypt is constructed under the celestial plan - "as above, so below". Really, if we want to understand the ancient building, it is necessary to explain a strict orientation of these building and their elements on legs of the world and on various astronomical phenomena. With what purpose was made it? Why it was so important? Such orientation allows fixing a time in which there was any a significant event. What a natural phenomenon allows to make it? The reason in that, that the axis of rotation of Earth itself makes circular motion, describing a cone for period about 26000 years. This phenomenon refers to as the precession, and the period of a full turn of the axis refers to as the Great year. Pursuant to this phenomenon, the picture of the starry sky (for example, altitude of stars above horizon) varies. It also allows using a precession as a "starry clock", permitting to fix and to transmit to far the time. The knowledge of precession was the largest secrets of sages, latent from uninitiated. Any observer of the starry sky will enter concept of coordinates for measurement of positions of stars and changes of their positions. Without it to study the sky it is impossible, it is difficult to do any conclusions and it is impossible to transmit the accumulated knowledge. For example, only from the analysis of the recordings about a position of stars for hundreds years was discovered (or again discovered) the precession by the Greek astronomer Hipparchus in 160 B.C. the line of the equinoxes (east - west). All these concepts were well known to the founders of pyramids. What system of celestial coordinates they used? In these article two lines, the line of equator and line of solstices will be used only. I shall consider the equatorial coordinate system, other versions I leave to the readers. For a basic circle in this coordinate system is adopted the celestial equator. Let's enter the some definitions. The straight-line parallel the axis of rotation of Earth, carried out (spent) through the centre of a celestial orb, refers to as the axis of the world - (Pn,Ps). The large circle of a celestial orb, the plane of which is perpendicular to the axis of the world, refers to as the celestial equator. 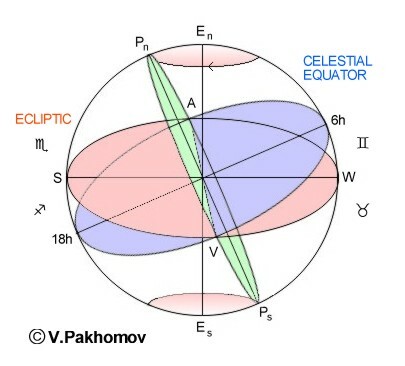 (V,6h,A,18h) – the line of the celestial equator. The Sun makes the apparent year path on a celestial orb approximately on the ecliptic (circle V,S,A,W). It is possible to tell that the orbital plane of motion of the Earth round the Sun is the plane of ecliptic. North Pole of the ecliptic - En. South Pole of the ecliptic - Es. The angle of declination of equator to the ecliptic varies and now is approximately equal 23° 27¢ . The small circles, from above and from below, round points En and Es represent a circle of precession. The point of cross of the ecliptic and the equator, which the Sun passes moving from a southern hemisphere of a celestial orb to a northern hemisphere, refers to as a point of vernal equinox - V. This point the Sun passes 20 - March 21. The point of autumnal equinox is diametrically opposite to it - A. This point the Sun passes 22 - September 23. (V,A) – the line of equinoxes. The point of vernal equinox in the astronomy is designated by the sign of Aries - ^ . I do not like this confusion. Let's leave zodiacal signs to the Zodiac, and for a label of a point of vernal equinox we shall use the letter V, from the word - "Vernal" equinox. This letter is similar to a sign of Aries. Point of autumnal equinox we shall designate by the letter A, from the word "Autumn" equinox. This point is opposite to a point of vernal equinox, and the letter A is similar to the inverted letter V, therefore it is easy to store. The point of a summer solstice (S) is in the Northern Hemisphere of a celestial orb and point of a winter solstice (W) - in the southern. (S,W) – the line of solstices. The large circles passing through both poles of the world refer to as the circles of declinations. The lines (6h, 18h) and (S, W) lie in one plane. In the equatorial coordinate system, the position of a point on a celestial orb is determined by two sizes: right ascension - a and declination - d.
A right ascension of a heavenly body is the arc of equator from a point of vernal equinoxup to a cross point of equator with a circle of declination of a heavenly body. The right ascension from a point of vernal equinox counter-clockwise is counted if to look at the equator from North Pole of the world, from 0 till 24 hours. A declination of a heavenly body is the arc of a circle of declination from equator up to a heavenly body. The declination in limits from 0 up to ± 90° is counted. From the equators to North Pole of the world the declination is considered positive, and to southern - negative. Both these coordinates do not depend on a diurnal rotation of a celestial orb. d of Orion, Mintaka, comes from the Arabic word for "belt"
e of Orion, Alnilam, means "a belt of pearls"
z of Orion, Alnitak, means "the girdle"
Angular distance Mintaka from equators (declination) for 2000 will be -0° 17¢ 56.8² . Here the coordinates of these three stars. Now we shall consider the pyramids, the photo of which is shown in the beginning of the article and their conformity to the stars. Pyramid of Menkaure [Mycerinus] ~ Mintaka. Pyramid of Khafre [Chefren] ~ Alnilam. Pyramid of Khufu [Cheops] ~ Alnitak. All of them belong to the antediluvian (before flood) type of architecture, examples of which are found out almost in all parts of the world. Pay attention - near the pyramid of Menkaure, three small pyramids were built on one line. The general view of this complex is shown in the figure (at the left). Putting in conformity the image of constellation of Orion with his earth implementation and by enumerating coordinates, we shall receive the following picture. The solid line, in figure, shows the position of celestial equator presently. The arrow shows a direction of moving of equator in a during of precession. The dashed line continues the line of three small pyramids, which, architecturally, represent this dashed line. If to consider, that their line sets a position of celestial equator, this position the celestial equator will take, for example, December 22, 2318. Pay attention, not the any coordinate line on a celestial orb, and one from base lines - the celestial equator here undertakes! Such coincidence, probably, will happen and earlier. Probably, it will coincide with any known prediction. To position of equator on "lines of pyramids" there corresponds declination of Mintaka in -0° 13¢ 26.8². But it yet limit, the extreme position of equator will take approximately in 2564. Then the declination of Mintaka will be -0° 6¢ 42.3². And then equator will be set back, the next Great year. Such points of crisis, in mathematician, refer to as extreme. Thus, is received, that, or the pyramids determine this extreme position, which the celestial equator takes once within Great year. Or determine a position close to extreme, which the celestial equator takes twice within Great year. As it is visible, the listed positions of equator differ within the limits of ± 5 minutes here again easily to make an error. And by the way about a title of a star Mintaka it is possible to name (Belt), celestial equator too figuratively as Belt of the sky! That is in a title of a star her significant attachment to celestial equator is fixed. for a half of the period of precession. You see the same 3 small pyramids and near the pyramid of Cheops! 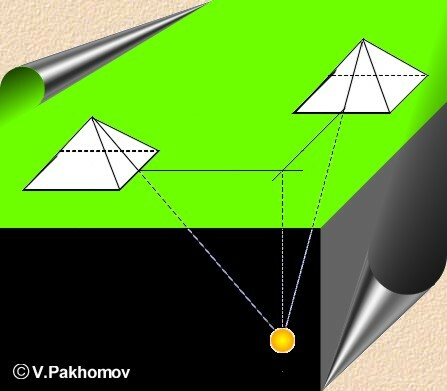 And their direction is perpendicular to a direction of three small pyramids considered earlier! Certainly, they also should be perpendicular, if express a base lines of celestial coordinates. These lines and in a nature are perpendicular. I speak about the line of equator and the line of solstices. Some words about Sphinx. How the Sphinx is oriented? The Sphinx looks precisely at East. By what this point is remarkable? Precisely in east the Sun ascends only two times per one year, per days of equinoxes. And as shown in figure of celestial coordinates, these two points determine a line of equinoxes. It is possible to tell that the Sphinx always looks in a point of vernal equinox on a celestial orb. He as though constantly monitors behind her. And by that his builders wanted to tell us, as we should closely monitor an phenomenon connected with this point. And what appearance is connected to this point? The precession of the equinoxes is connected to this point; the phenomenon of precession is connected! Sphinx is symbolical expression of this phenomenon. But I shall tell about it later. Now it is possible to draw the pyramids with two dashed coordinate lines of pyramids and constellation of Orion with two appropriate coordinate lines. Here I once again emphasize that not the any coordinate lines, and two mains, base lines - the celestial equator and line of solstices undertake! The line of solstices marks two points of an extreme position of the Earth on her orbit. It is a point closest to the Sun and point of the position removed from the Sun, of the Earth. 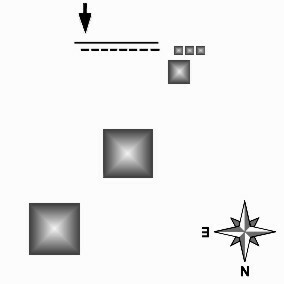 In figure are represented: 3 large pyramids, 3 small pyramids near the pyramid of Menkaure, and 3 small pyramids near the pyramid of Cheops and Sphinx. The program StarCalc 5.0 obtains the image of Orion constellation with the reticule pattern on the date of December 22, 2318, 0h 0m 0s. On this starry map the line of equator (0°) and the line of solstices (6h) is shown. Pay attention, that a direction on north in these two images, in the sky and on the Earth isdiametrically opposite. How you think, about what it speaks? How it is possible to explain it? On my evaluations, now second line of the three small pyramids corresponds on a celestial orb to the right ascension 5h 43m 46s. will coincide with a line 6h, with the line of solstices. Such coincidence with a line 6 - 18 hours was and in 10642 - 10546 years, that is for a half of period of precession up to now. The period of precession is equal 25920 years, as at ancient or 25729 years under the modern data. If to take into account the coincidence of both coordinates with the image of pyramids, such coincidence can be only once for the period of precession! Signifies or it was 26000 years back, or to this number it is possible to add an integer of cycles of precession, or will be in the near future. Except for accuracy of the data about location of pyramids at their construction, it is necessary to take into account and the accuracy of the data about the location of stars, having been available at the builders. While we know, that the observation of the starry sky were made in Ancient Egypt with the help of very primitive tools - a wooden stick split on one end and a plumb-line. But if to assume what it so primitively and was, then it is necessary to ask, and who built a pyramids? The time of approach of the next planetary catastrophe is indicated. The time of returning of "gods" promised by the gods "second arrival" is indicated. The time former, at least, one Great year back and connected with any extreme event, for example, world flood and loss all alive on the Earth is indicated. These suppositions are possible, if in the past the axis of the Earth did not change its direction. So, we have found out with coordinate lines of the sky. Now following question. And what is on ground in a cross point of lines of pyramids? I name this point – the Point of Thoth. By name of the Egyptian god of wisdom, account and writing. From experience of decoding of the Calendar Message I know, that the multivalent of concepts, definitions and facts is inherent in this intelligence. Thus each value from this multivalent is exact and independent. Therefore, if with the help of pyramids the date is given, signifies with the help it something is given and still. I think what exactly in this point of Thoth, on ground and is necessary to search for the heritage of a great civilization. This article was written two years back. Recently, I was acquainted with one more document – The Emerald Tablets of Thoth. About The Emerald Tablets is written much. Unfortunately, I do not know what to tell about the particular document, on which I give the link. I do not know true it is the document or literary product, but it is interesting. Read one citation. “Now shall I speak to thee knowledge ancient beyond the thought of thy race. Know ye that we of the Great Race had and have knowledge that is more than man’s. Wisdom we gained from the star-born races, wisdom and knowledge far beyond man’s. Down to us had descended the masters of wisdom as far beyond us as I am from thee. List ye now while I give ye wisdom. Use it and free thou shalt be. By reading it, I have made the following image. In this image the position of "heritage" left to us, and where, and on what depth is precisely indicated. And one more, the most important question. If we shall discover the heritage, whether it is necessary it to open? Whether we prepared for shall open us "the box of Pandora"? The Greek myth have alert. Pandora had a jar which she was not to open under any circumstance. Impelled by her natural curiosity, Pandora opened the jar, and all evil contained escaped and spread over the earth. She hastened to close the lid, but the whole contents of the jar had escaped, except for one thing which lay at the bottom, and that was Hope. All was designed for the simian curiosity of the people? It is necessary to remember - they are a reminder that civilizations existed thousands of years ago which were more advanced than ours today. Therefore it is good to answer the questions. Where and why these eggheads have disappeared? And why our ancestors have survived? The arrows of clock of pyramids have stopped at the moment of the awful catastrophe, at the moment of the loss of a Great civilization. HE WHO DOES NOT REMEMBER HISTORY, IS BOUND TO REPEAT IT.